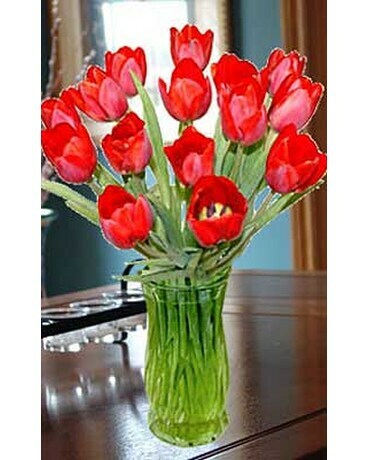 This bright selection contains 15 Red Tulips for your favorite Valentine. Also included are a quality message card, floral preservative and flower care information. Our price includes a vase which others charge up to $10.00 for! They arrive at the recipient's door within 24 hours from the time they’re cut! Your flowers come elegantly wrapped in a decorative sleeve and are hand packed in an attractive gift box. !